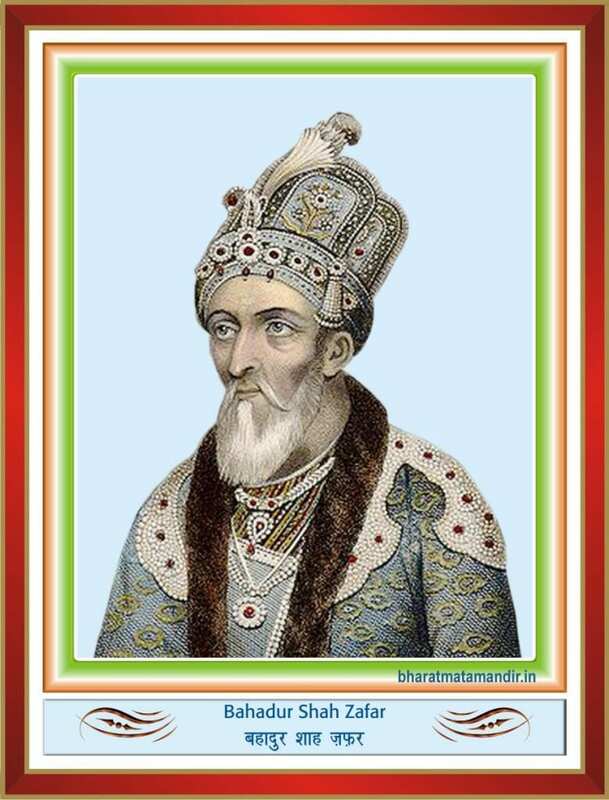 The last Mughal king, Bahadur Shah, better known as Bahadur Shah Zafar, was born in 1775 at Delhi. He was the son of Akbar Shah from his Hindu wife Lalbai. After the death of his father, he ascended the throne in 1837, during the British rule, when he was little over 60 years of age. The British had curtailed the power and privileges of the Mughal rulers to such an extent, that the Mughal rule was confined to the Red Fort. Bahadur Shah Zafar was obliged to live on British pension, while the reins of real power lay in the hands of the East India Company. During the reign of Bahadur Shah Zafar, Urdu poetry flourished and reached its zenith. He himself was a prolific poet and an accomplished calligrapher. Love and mysticism were his favourite subjects that found expression in his poetry. Most of his poetry is full of pain and sorrow owing to the distress and degradation he had to face at the hands of the British. It was at the time of Bahadur Shah that the war of Independence in 1857 started. In Bahadur Shah Zafar the freedom fighters found the symbol of freedom and therefore nominated him as their Commander-in-Chief. In the initial stages, the freedom fighters were successful, but later on the strong and organized British forces defeated them. Bahadur Shah, who was proclaimed as an emperor of whole of India, was overthrown. He was arrested from Homerun’s tomb, in Delhi, where he was hiding with his three sons and a grandson. Captain Hudson killed his sons and grandson and their severed heads were brought before him. Bahadur Shah Zafar himself was tried for treachery. He was exiled to Rangoon, Burma (now Myanmar), in 1858 where he lived his last five years and died in 1862 at the age of 87.